I’ve always been a communicator. I have a diverse professional background in television broadcasting and other media, in arts and classical music, and in administrative positions in fields ranging from ballet to personal finance to particle physics. I also have personal interests in classical music, history, literature, psychology, philosophy, science, and genealogy. In my time off, I enjoy playing the piano, swimming, walking, and hiking in my local mountains or travelling to warm locales, where I like to explore, swim, snorkel, or relax on the beach with a good book. Most of all, I’m a logophile—passionate about words—and I’m fortunate to be able to apply that passion to my editing work every day. I’m a lifelong learner and approach each new editing project with a sense of wonder and curiosity. Freelance manuscript editing, proofreading, and manuscript evaluation draw many of these disparate careers and enthusiasms together. I have a wide array of experience with both fiction and nonfiction in dozens of genres including biographies, memoirs, science, history, spirituality, finance, how-to books, self-help books, and books for children and young adults. 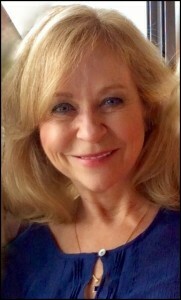 To see my experience in many other genres, please visit my Portfolio page. I especially enjoy working closely with authors, whether they’re self-publishing, planning to find an agent, or are already with a publishing house. For two years I worked on physicists’ papers in the publications department of TRIUMF, the particle and nuclear physics lab at UBC in Vancouver, Canada, and I spent a further two years as the editorial proofreader at the respected weekly newspaper Business in Vancouver and each of its subsidiary special publications and magazines. I’ve worked on corporate projects such as newsletters, grant proposals, marketing materials, and websites. From this broad base, I’m always eager to expand my repertoire. Since 2014, I’ve been freelance editing and proofreading for Penguin Random House Canada, Harbour Publishing, and Douglas & McIntyre. This means my experience encompasses the entire spectrum of freelance editing, from working closely with self-publishing authors to working with established authors using the processes and methods common to big publishing houses. In May of 2014, working with Penguin Canada for W.W. Norton in New York, I completed the American-edition proofread for Giller-Prize-winner Johanna Skibsrud’s forthcoming novel, Quartet for the End of Time. In August 2014, I proofread the third book in Jack Whyte’s historical fiction series The Guardians. I take great pleasure in doing speaking engagements on the importance of editing, on fiction writing and editing, and on editing as a career. I’ve presented talks with the late self-publishing guru Dan Poynter at the Toad River Writers’ Retreat near Fort Nelson, British Columbia, the Puerto Vallarta Writers’ Conference, and Infinity Publishing’s Express Yourself authors’ conference in Valley Forge, Pennsylvania. 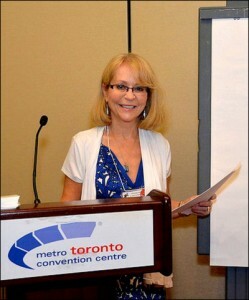 In May 2012, I spoke about fiction writing at a meeting of the Canadian Authors’ Association, BC Branch. I’ve presented editing career-building sessions at Okanagan College and at the Editors’ Association of Canada’s May 2011 conference, among others. I’m enthusiastic about educating authors on the value of hiring a manuscript editor (for more on hiring an editor, click here) and would be delighted to add my insights, expertise, and humour to your next authors’ or writers’ group meeting. In 2014: At the Editors’ Association of Canada conference in Toronto, I was the moderator of a panel discussion called The Future of Self-Publishing and Editors. In October in Vancouver, I gave a presentation on how to format your manuscript for editors, agents, and publishers at a meeting of the Canadian Authors’ Association, BC Branch. In June 2016 at the Editors Canada conference in Vancouver, I again presented my popular session on how to work with self-publishing authors. In November 2016, I began teaching writing and editing at Okanagan College. In spring of 2017, I taught three different courses at Okanagan College, Kelowna Campus, for the Continuing Studies department: editing as a career (Editing 101), editing for non-editors (Grammar 101), and four fiction-writing workshops. And in June 2017, I again presented two sessions at the Editors Canada annual conference, Guardians of the Lexicon, held in Ottawa-Gatineau that year to celebrate Canada’s 150th birthday. In May 2011, I was nominated as one of three finalists for the prestigious Tom Fairley Award for Editorial Excellence, Canada’s top editing award. Of particular significance was that the nominated book I edited, Brain School by Howard Eaton, was the first ever self-published book nominated for this 35-year-old award presented by the Editors’ Association of Canada. 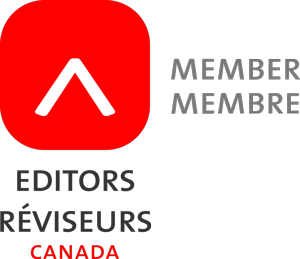 I’m a long-time, active member of the Editors’ Association of Canada, and I’ve taken courses with Simon Fraser University’s Writing and Publishing Program to keep my skills fresh and to keep abreast of current trends in writing, editing, and publishing. My editing business and I were featured, along with my colleague, book designer Fiona Raven, in a 2006 Vancouver Sun newspaper article titled “A bonanza for editors” by Rebecca Wigod. To read the full article, click here. I’ve been writing, and helping others with their words and writing, for as long as I can remember. Every stage of my professional life has involved writing, editing, and communication. In 2002, I embraced manuscript editing, proofreading, and manuscript evaluation as a full-time career. My rates are still competitive, and I labour over each manuscript as if I had written it myself. With this combination of passion, broad experience, and my flexible schedule, you can be assured of the most pleasant editing experience you’ll find anywhere—in person, by phone, or by e-mail. I’ll be delighted to provide you with a free estimate for manuscript editing, proofreading, manuscript evaluation, or any other related services you may need. Please visit my Rates/request a free quote page and take a few minutes to fill out my quick, simple request form.